Starting at 7:30am – We’ll gather at Matick Chevrolet, to enjoy continental breakfast, festivities and each other. 9:30am – Formation and photos begin. 10:30am – We begin our organized and escorted cruise to our destination. 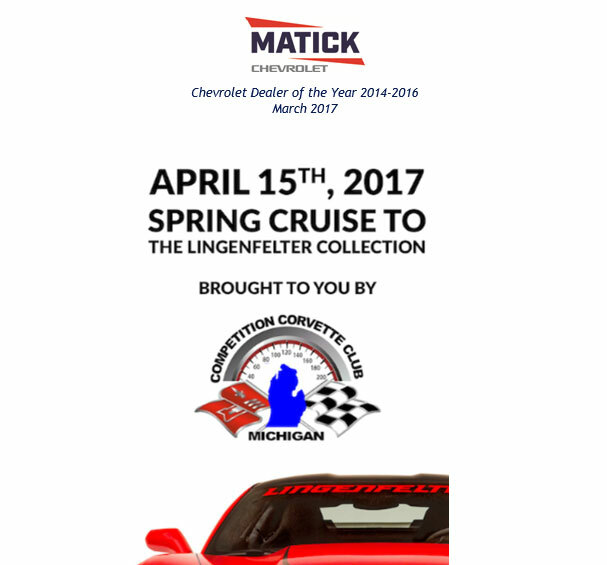 By 11:30am – We will arrive and prepare to enjoy admission into the exclusive Lingenfelter Collection. And as if the event itself isn’t enough, know that your participation helps the Competition Corvette Club of Michigan to accomplish its mission to assist collegebound students with the purchase their text books!